A car battery is an integral part of almost any automotive vehicle. Not only do they help start your car, but they also power many of the features within, and help keep your devices charged on the go! That’s why a dead battery can be one of the most frustrating car problems to encounter–and often one of the easiest to avoid. The average car battery has a lifespan of anywhere between three and five years–and performing some simple maintenance will ensure top performance. Today, we’ll be explaining how to care for and properly clean a corroded car battery yourself with household items. Over time, battery terminals may develop corrosion. As you drive your car, corrosion may form on the car battery’s terminals and cable ends. If either cable end isn’t connected properly because it is obstructed by corrosion, the vehicle won’t have the power to start. 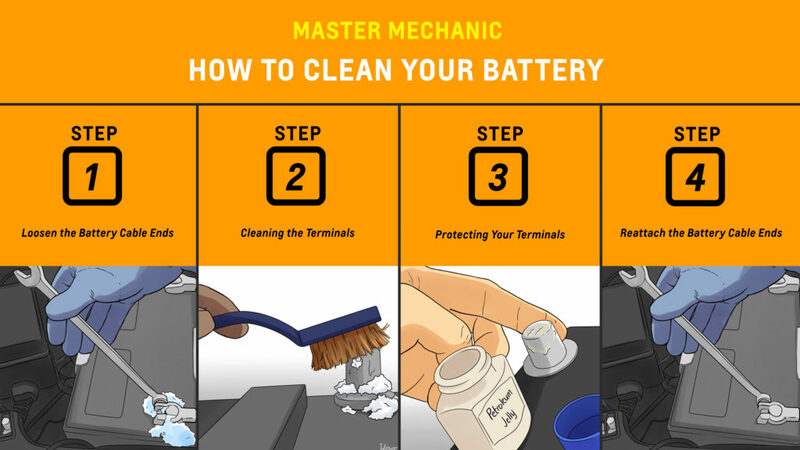 Cleaning your battery regularly is one of the most important things you can do to extend its life and ensure that it’s operating efficiently. Recognizing corrosion is easy. It appears as a fuzzy-looking residue on the terminals and cable ends and is usually white or green in colour. The good news is that it is relatively easy to clean, as long as you take the appropriate safety precautions. ATTENTION: Anytime you’re working with your car’s battery, equip yourself with rubber gloves, long sleeves, and safety goggles. First, make sure your car is off. Begin by removing the negative cable using a wrench. Remove the cable from the post, then repeat the process for the positive cable. With everything removed, take a second to inspect the car battery and make sure there are no cracks, leaks, or more significant issues at hand. If you think there might be, do not handle the battery. Call your local Master Mechanic to book an appointment immediately. Although they work exceptionally well, using a store-bought battery cleaner and protective spray is not necessary. A mixture of one tablespoon of baking soda to one cup of water works just as well to neutralize the acid. Simply mix thoroughly, dip your brush, and begin scrubbing the residue you see around the car battery. After repeating this process a few times, you should be able to remove most of the visible corrosion on the terminals. If you are using a cleaning product, spray the terminals and wait for the acid to neutralize. Many sprays change colour to indicate that this has happened. Once neutralized, scrub until clean. When you finish scrubbing away the corrosion, use cold water to rinse off any remaining residue. ATTENTION: Ensure you wash away all the baking soda/cleaner before you dry the battery and clamps with a clean towel. Dry off the battery terminals before reattaching the terminal clamps. Place the positive battery cable end back on and tighten. Do the same for the negative cable end, be sure not to overtighten as you may damage the clamps. Next, you’ll want to spray the terminals with battery protector spray or apply a thin layer of petroleum jelly. The petroleum jelly/spray helps protect against future corrosion. As we mentioned above, while you’re cleaning your car’s battery terminals and cables, you might notice a more significant issue that needs the attention of a professional. If that’s the case, or you don’t feel comfortable doing the job yourself, don’t hesitate to contact your local Master Mechanic with questions, or to book an appointment.